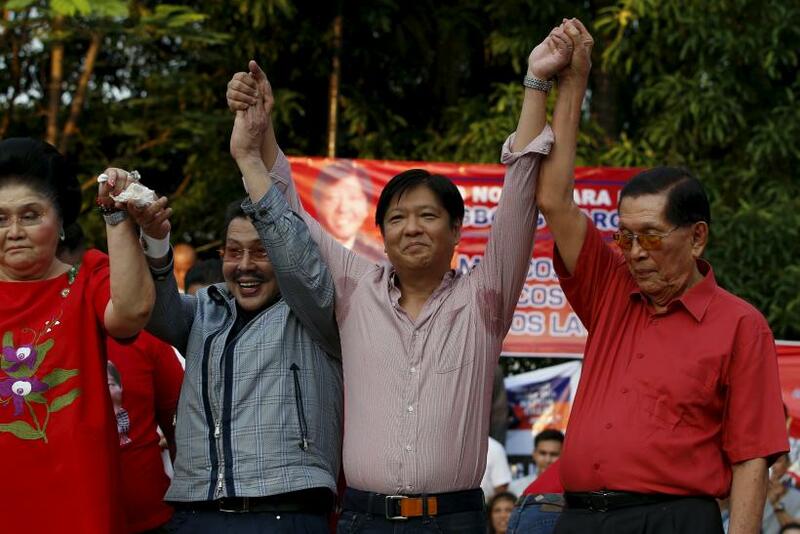 MANILA -- There could be a new, old player in next year's already messy Philippine presidential election, where this week the front-runner was disqualified, and a dark horse candidate caused a stir by talking about his girlfriends and cursing the pope. Former President Joseph Estrada says he will run if the front-runner, Senator Grace Poe, daughter of his late best friend, is barred from doing so. While the deadline for the filing of candidacies expired on Oct. 16, political parties are allowed to change their candidates until Dec. 10. According to The Philippine Star, Estrada says he could replace the candidate of a small party called Kampil, which has worked with him in the past. Plus, if Poe isn't allowed to run, many of her supporters -- 49 percent according the most recent poll -- may flock to Estrada. The neophyte politician acknowledges a lot of her support comes from fans of her late father Fernando Poe Jr., a movie star like his best friend Estrada. The elder Poe ran for president in 2004 and was allegedly cheated by Arroyo. He died of a heart attack that year. Poe was disqualified by a division of the Commission on Elections for two reasons. First, because she was adopted and her biological parents unknown, she can't prove she's a "natural-born Filipino," a legal requirement to run for president. Second, the commission said she doesn't have the required 10-year Philippine residency based on how she answered that question when she ran for senator three years ago. Poe, who had spent about 15 years in the U.S., even acquiring U.S. citizenship, said she answered wrongly three years ago. She can appeal to the full commission and, if needed, to the Court of Appeals and the Supreme Court. Disqualification aside, Poe's main competitors are Vice President Jejomar Binay, with 24 percent support, and former Interior Secretary Manuel Roxas, with just 21 percent support despite the backing of popular President Benigno Aquino III. Binay, who ruled the financial capital of Makati from 1986 until he passed it on to his son, is facing corruption allegations he says are a "demolition job" engineered by Roxas' supporters. Last week, however, Rodrigo Duterte, mayor of the big southern city of Davao, said he would get his party to make him presidential candidate in place of a little-known party-mate who had been seen as a placeholder for him. His reason was he didn't want "an American" to be president, referring to Poe. He immediately caused a stir by talking about multiple wives and girlfriends, and also cursing Pope Francis for traffic he said he experienced during the pope's visit to the Philippines earlier this year. That may not hurt Duterte's popularity stemming from a tough-on-crime reputation, which, however, also includes allegations of human rights violations. Before his announcement, a poll showed him leading even Poe in Metro Manila.